Pat Krause/Daily Globe (Ironwood) Lake Linden-Hubbell's Peter Heikkinen defends Wakefield-Marenisco's Shane Cole Tuesday night in Wakefield. WAKEFIELD — Wakefield-Marenisco played solid offensive and defensive basketball, upending Lake Linden-Hubbell 52-34 in a Copper Mountain Conference battle in the Cardinal Gym on Tuesday night. Four Cardinals scored in double figures as Bailey Ribich led the way with 17 points, Mason Saubert dropped in 11 and Shane Cole and Jason Suzik notched 10 apiece. Ribich and Saubert went on a three spree and combined for six triples. “It was a pretty physical, rough game,” W-M coach Terry Fetters said. “Ribich and Saubert both did a nice job shooting. And they stretched the defense and opened things up for Cole and Suzik. Jake Suzik played sick today. He was in the hospital last night with a bad case of the flu and had IVs in him. I give him credit for playing. The Cardinals have traditionally been a real good offensive team, but Fetters said he is “really proud” of the defense his team is playing this year. Lake Linden coach Jack Kumpala sounded like a coach who wasn’t sorry to see the season coming to a close. “For us, it’s the same song in a different city,” Kumpala said. “We get in foul trouble and then its cold shooting. It’s been the same for the last 2-3 weeks. We’ve struggled to score and we’ve not been very good. We’re not patient enough to work for good shots. Both teams started the game slowly, but Ribich got the Cardinals rolling with a 3-ball from the left corner at the 2:17 mark to go up 8-5. Kumpala saw real trouble for his team when his two big players (Jason Sutherland, Lincoln Klein) were whistled for two fouls and had to sit. The score stayed at 8-5 at the quarter, but W-M opened up a 14-7 lead on scores by Ribich, Suzik and Shane Cole. 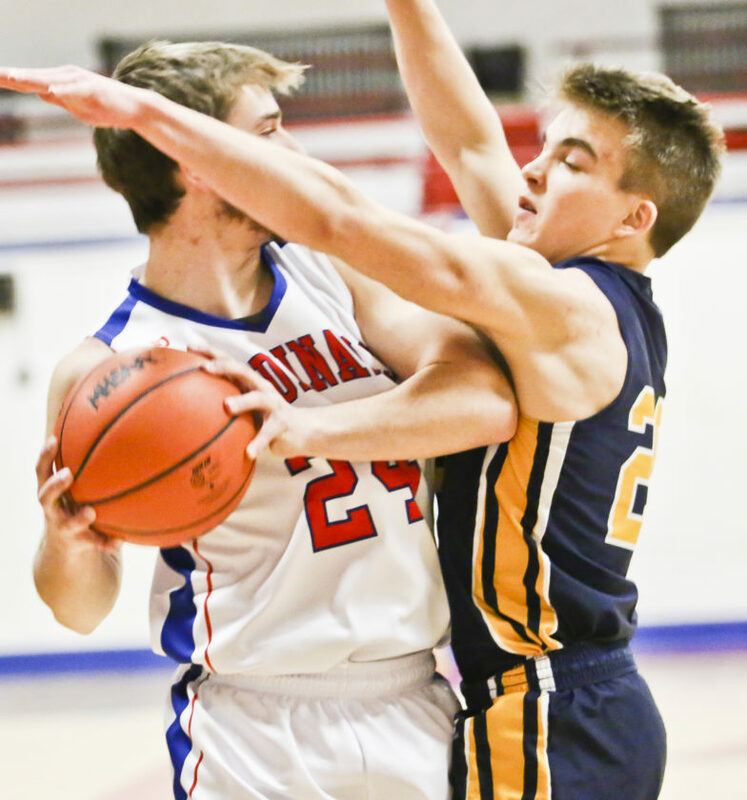 Saubert kept the lead at six points (18-12) when he drove towards the baseline, was knocked off balance but still managed to put a floater-type shot through the net. Ribich scored again on a drive, but Lake Linden’s James Tuovila sank two free throws with 0.6 seconds left to end the half with a 20-14 deficit. The Cardinals took even more control of the game as they started the third quarter with a 12-2 surge. Saubert splashed two deep 3s from the same spot on the left wing, Suzik added two free throws and Cole went up, hung in the air and his shot hit nothing but net. Cole made another nice move with a pump fake and shot in the lane as W-M doubled up its lead to 32-16 with 3:16 remaining. W-M led 36-23 after three quarters. The teams traded triples in the fourth quarter, but the Cardinals got inside more and scored on lay-ins that kept Lake Linden at bay and won going away 52-34. Baccus was the only Lakes play to reach double figures with 12 points and Sutherland added nine. Lake Linden won the junior varsity game 59-49. The Cardinals travel to Watersmeet for a Copper Mountain Conference game on Friday. LL-H (5-11, 5-8) goes to Jeffers on Friday. Lake Linden – Carter Crouch 2, Connor Baccus 12, James Tuovila 7, Jason Sutherland 9, Lincoln Klein 2, Bradley Moilanen 2. FT’s: 9-12, Fouls: 11, Fouled out: Klein, 3-pointers: Baccus 2. Tuovila 1. W-M – Bailey Ribich 17, Mason Saubert 11 Jacob Suzik 10, Shane Cole 10, Jacob Franklin 2, Erik Hakamaki 2, Brett Heil 2. FT’s: 8-11, Fouls: 12, Fouled out: none, 3-pointers: Ribich 3, Saubert 3.